Invigorating. Exhilarating. Exotic. These are just some of the words that describe this exquisite offering from our Black Magic Collection – the Orange and Lemongrass 3 Wick Candle. Brightening up the atmosphere, this candle is light and bright when the day outside is anything but. Colourful and juicy notes of orange and lemongrass are wonderfully complemented by rich tones of basil, lavender and geranium. The Orange and Lemongrass 3 Wick Candle is the perfect accessory for any stylish home. Our Orange and Lemongrass 3 Wick Candle is one of the finest choices out there. Made from superior natural waxes with soot-free wicks and sultry essences, it can only be from Parks London. From our Black Magic Collection, this candle is exotic, vibrant and fresh, with notes of orange, lemongrass, basil, lavender and geranium. The combination of lemongrass which is native to Asia and Geranium, which is mostly found in the eastern part of the Mediterranean region, makes a wonderfully unique aroma. Delicately created and hand-poured into a classic black jar, this candle is as pleasing on the eyes as it is on the nose. At 11cm in height, this 3 Wick Candle creates a lasting fragrance to fill your home with an exhilarating scent for approximately 80 golden hours. 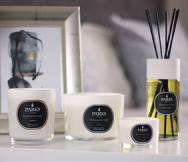 This winter, try a Parks Candles and find out why we are renowned for producing incredible scented natural wax candles.